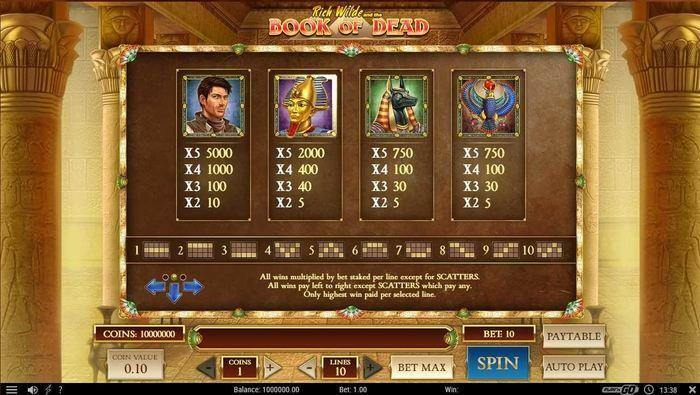 If you’ve joined the online gaming community recently, then it’s highly likely that Book of Dead is the most popular slot and the best one of all time. We tend to disagree on the first part, but the second is close to the truth. Book of Dead is a video slot which grasps the players’ attention with its visuals and keeps them coming for more with it's outstanding, yet highly volatile prizes. This mix of high volatile prizes and modern looking video followed by adequate audio basically justify its success! Nevertheless, there’s something about the frequent Book of Dead free spins provided by operators as well! What is Book of Dead? Book of Dead is a 5 reel video slot which is based on a rather popular theme, following the adventure of an explorer, in this case, that’s Rich Wilde. Book of Dead comes with a 10 free spin bonus game, which is extremely rewarding, but it may take you some time to trigger it. We’re going to discuss each of the aforementioned features, but first, let’s cover the basics. Play Book of Dead slot! Book of Dead is budget friendly, meaning all players can enjoy it without worrying whether they’re going to break the bank. Players can adjust the coin size, the number of coins per active line, and on top of this, they can also set the number of active paylines. In simple words, the player is in full control of the gameplay. However, we recommend playing Book of Dead with all paylines activated. Why? This will increase the frequency of wins, which only improves the gaming experience. If your budget is your limit factor, which in most cases, it is, we recommend reducing the coin size. You will have more resources, longer playtime, which translates to more chances to win. Since it’s a high volatility slot game, one or two bonus games is all it takes to recuperate some losses. This is the best time to advise you to avoid chasing losses. How to Play the Book of Dead Slot? Another special feature of Book of Dead is the Gamble. After each win, the interface will change, showing two other buttons which take the place of Bet Max and AutoPlay buttons. You can either collect your winnings, or gamble them, which if successful, will double your wins. Note, gamble wins rarely, almost never contribute to wagering requirements. Unsurprisingly, Rich Wilde is on an adventure in Egypt, trying to find the Book of Dead. Ancient Egypt motifs are pretty common in the gaming industry, it’s only a matter of question, whether the casino game designer will do a good job. Well, Play’n Go sure did an amazing job! All symbols are in line with the general theme, depicting certain elements which scream “Pharaohs”, “Pyramids” and “Egyptian Gods”. The low paying symbols, 10 to A, are also given a touch of Ancient Egypt. However, the high paying symbols, of which you want to see more are Rich Wilde himself, the Pharaoh and what appears to be an avatar of Anubis. There are two special symbols more, which are even more rewarding, the Book of Dead which is the Scatter, and although we said it’s a special symbol, in reality, one symbol is chosen to be the Expanding Wild. We’ll go through the details in the next section. Book of Dead has a theoretical return to player of 96.20%, which is pretty much average. In spite of the average RTP, it’s a rather volatile slot, and it can feel as if it’s a slot with an RTP of less than 94%. 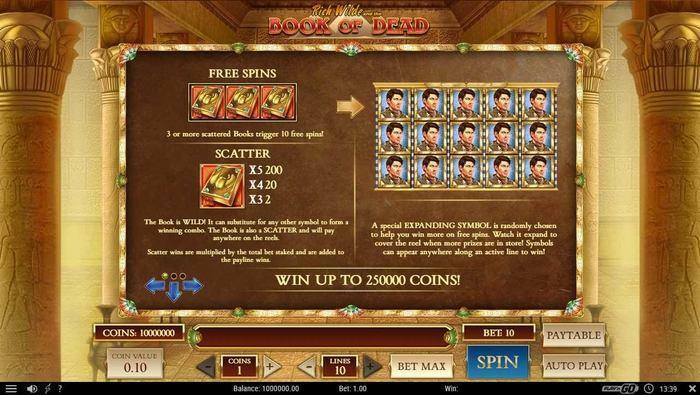 As we already mentioned, the key selling point of Book of Dead is the 10 Free Spins bonus round. It triggers when you land 3 or more Scatter symbols, which, besides paying a hefty amount, also gives you 10 free spins. It’s what players love about it, and we’re pretty sure you’re looking forward to it as well! The jackpot is also quite admirable, with 250,000 coins up for grabs, every player is excited to see 5 Rich Wilde symbols on the reels. Since it’s a 10 payline slot, wins are not that frequent, but this also takes the entry bet threshold way down than what other slot machines mandate. Overall, Book of Dead makes simple bonus elements look way more exciting than they are, if compared to, say, a NetEnt slot or some of Play’ N Go’s other slot games. Where to Play Book of Dead Slot? Book of Dead is currently one of the most widely available slots, sort of like Starburst. Instead of looking for where you should play Book of Dead based on the game offer, you should prioritise the quality of the casino bonus deals, like Free Spins and bonus terms. Nowadays, it’s rather easy to find Book of Dead free spins. However, this can change in an instant since the online gaming industry is extremely dynamic. This is why we recommend playing Book of Dead at a well-established, generous UK online casino that will offer bonus deals even once you lose the new player tag. Below, you can find 3 online casinos that are exceptional hosts both to new and existing players. It’s sort of a public secret, but online casino studios try to copy the approach that has worked for other game providers. Besides this, it’s all about the legal aspect, whether the game is available in a certain market. This happened to NetEnt in Canada. Once the Swedish casino game producer moved out, Play’n Go dominated Canadian online casinos with this game in particular, Book of Dead slot. 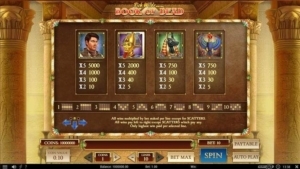 In addition, with Novomatic moving out of certain online gaming markets, and their Book of Ra slot going offline, Book of Dead became the dominant slot game. 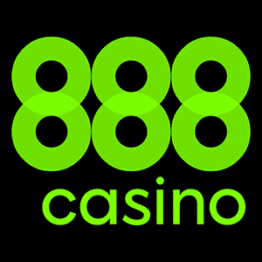 The principle of “Book of (insert any term)” is pretty common, and most casino game providers have at least one game of this kind in their portfolios. The only thing which makes one game better than another one is the access to casino bonus deals and free spins, in which Book of Dead simply excels! Conclusion: Perfect Timing for a Perfect Video Slot Machine! Book of Dead has the necessary elements to reach the top and stay there, something we all have witnessed in the past period. Play’n Go were sort of lucky. They got the perfect situation and they took full advantage! Free Spins? You got it. Bonus round with more free spins? You got that as well. High Jackpot? Don’t worry about it. And most importantly, Book of Dead featuring Rich Wilde looks good! Available on desktop and mobile, you can play it anytime and anywhere!